If you are feeling uninspired about your current kitchen configuration and the result is a serious lack of passion or desire to spend time in one of the focal-points of your home, you may just need to put some personalized touches on the old galley. Mix and match. Mix and match, but know when each is appropriate. Just because you inherited a kitchen or chose a kitchen that you aren’t currently thrilled about, does not mean you are stuck with it! Play with different styles, colours even era-specific aesthetics. Choose complimentary colour schemes for the counters and floors, and mix-up your dinnerware with some traditional and modern styles linked together by a common colour or pattern. Geometry matters. 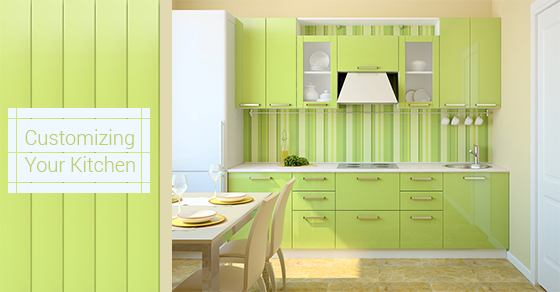 If your kitchen has started to feel boring and monotonous, it may be that that the lines have made it that way. If everything is square, or round or facing the same direction, offset the continuity. If the table is round, accent it with some square-backed chairs, if your counters are square, add some curved or asymmetrical light fixtures overhead. Add some distinguishing features. If you have been dreaming of replacing all of the cabinetry in your kitchen but it just isn’t in the current budget, consider replacing half of them, or even a single bank of them to throw off the monochrome look. Same can be said for your counter scheme. If you can’t do the whole kitchen in granite, how about just a single section? Add some contrast. Nothing creates a feeling of complacency more than uniformity. If your kitchen table is made of a dark, rich wood, consider adding some lighter coloured chairs. If your cabinets are light, offset it with darker counter tops. Think simple. Our minds are trained to pick up little details and process them subconsciously. Even making, what may seem like, minuscule changes, like rearranging the knobs on your cabinetry, can add a feel of originality that brings like back into the kitchen. A customized kitchen does not have to be about having the best or most expensive or everything, or anything. It is about recognizing you have your own, unique style and taste and ideas on cohesion and balance and realizing a vision which incorporates it all. For more information on how you can create the ideal kitchen on any budget, contact the Avonlea team today!